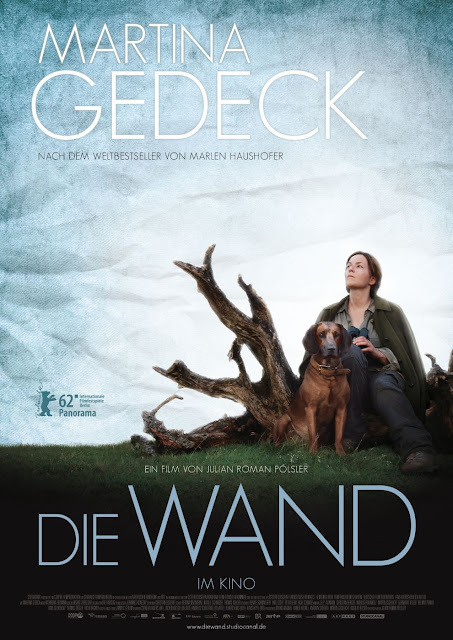 A woman (Martina Gedeck) and a dog named Lynx become inexplicably stuck behind an invisible and impenetrable wall surrounding the Austrian countryside, where she was vacationing at a hunting cabin. Her two companions, who left to a nearby village, never returned. When reading the concept for "The Wall," it sounds kind of interesting, doesn't it? Some weird, magic, invisible wall traps a woman in the Austrian countryside and she cannot escape. We're always down for mysteries like this. Unfortunately, the movie isn't nearly as compelling as the concept sounds. We know films can be done successfully with only one real cast member. There are many stories of hope and survival where a single person learns to exist and survive on their own. Movies like "Cast Away" and "All is Lost" have managed to be fairly successful at it. Unlike those films, "The Wall" is not a story of hope, survival, or overcoming adversity in the face of great odds. This is a story about loneliness, depression, and despair, and it sure as hell feels like it from the second the woman gets trapped. Also, unlike the previously mentioned films that rely on visuals to tell the story, "The Wall" is all told through a voice over style of narrative, which is more like listening to a book on tape with a few visual aids than a feature length film. The woman talks at length about all of the actions her character does on screen, like hunting, milking a cow, harvesting hay, etc, as well as how she has had to learn to do these things in order to adapt to her current predicament. She also talks about her feelings of loneliness, sadness, and depression, as well as coming to terms with the fact that her situation is likely to remain unchanged. It is obvious from her narrations there is nothing she can do about exiting her new-found entrapment. This is all well and good, but there is a lot left unexplained in this movie, and this we don't like. We, the audience, just have to accept that an invisible wall appeared for no reason and the cause of it will never be explained. We have to accept that there was already a cow within the wall and miraculously, the cow was pregnant. Most the movie consists of the woman walking around hunting, hiking, lounging, and farming, and to be honest, it gets rather dull really fast. Long and wide shots of the beautiful Austrian countryside just aren't enough to carry this movie, nor was Martina Gedeck's performance, not that she was terrible, but it's just not enough. When a single actor has to carry an entire film, it takes an overly exceptional performance to pull it off, and though she was fine in her role as the nameless woman, she was far from exceptional. "The Wall"/"Die Wand" is simply one of those movies that get eaten up by the pretentious, snobby film festival circuit crowd as they constantly praise its symbolism and its methodical nature. Self-reflective character sketches are a go-to for independent and international filmmakers, but they have to be entertaining and at least keep us from falling asleep to be considered good. In the end, we don't need a big, flashy action movie or an uproariously hilarious comedy to remained entertained, but what we were given with this movie is severely lacking. While we empathize with the woman's situation, the movie as a whole is just not as deep and introspective as it thinks it is. One year ago, we were watching: "Maleficent"